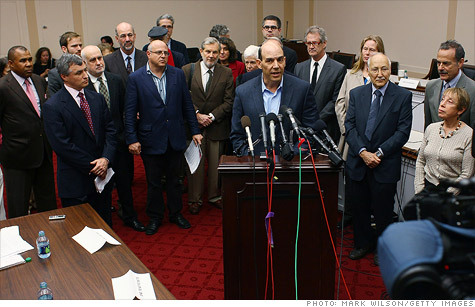 A group of millionaires visits Capitol Hill to ask lawmakers for a tax hike to help cut deficits. WASHINGTON (CNNMoney) — A group of two dozen millionaires stormed Capitol Hill on Wednesday, demanding lawmakers raise their taxes. They planned to push lawmakers to reject any deal that the so-called super committee delivers that doesn’t raise taxes on millionaires. The 12-lawmaker panel has until next Wednesday to agree on $1.2 trillion in savings over the next 10 years or risk automatic spending cuts. “If the super committee bill doesn’t raise our taxes, we will ask our fellow citizens to consider killing the bill,” said Eric Schoenberg of Franklin Lakes, N.J., an adjunct professor of marketing at Columbia Business School. They planned to take their message to members of the super committee, Tea Party Republicans including Rep. Louie Gohmert of Texas and Rep. Tom Price of Georgia, and even anti-tax champion Grover Norquist. The group was formed a year ago to push for expiration of the Bush tax cuts, and includes several current and former Google employees. Some of the better-known millionaires in the group include economist Nouriel Roubini, and a few celebrities, such as “The Sopranos” star Edie Falco and filmmaker Abigail Disney, who didn’t make the trip to Washington. Five different members declined to say what their annual income is, only acknowledging that they could be called millionaires. Massachusetts millionaire Farhad Ebrahimi, a 33-year-old philanthropist who inherited his money from his software entrepreneur father, said he also supports the so-called “Buffett rule” that would require millionaires to pay a higher percentage of their income in federal taxes than those who make less than a million a year. The rule is named for the measure’s chief supporter, Berkshire Hathaway (BRKA, Fortune 500) chairman Warren Buffett. But he said the first thing on the group’s bucket list is convincing Congress to allow Bush tax cuts to expire for the wealthy. “What we’re all here today representing is to request the Bush tax cuts be allowed to expire — that’s simply the bare minimum,” said Ebrahimi, who has also participated in protests in the Occupy Boston movement. California venture capitalist Garrett Gruener, founder of Ask.com, told left-leaning House members on the Progressive Caucus said he doesn’t buy the argument that hiking the tax rates for the wealthy and forcing them to pay more in taxes would stymie business growth. This entry was posted in In the News and tagged high income, high income tax cuts, millionaires, taxes. Bookmark the permalink.